When is a Ferrari not a Ferrari? When it is a 'Dino'. How so? Well, what defines a Ferrari? Why, the prancing horse logo, of course! But the 246 only ever wore Dino GT insignia. The firm's founder, Enzo Ferrari, wanted this car to be a 'marque' all its own. There was a good - and moving - reason for that. He had prematurely lost his son Alfredino - so the 'Dino' was a father's tribute. Enzo, though, would have been the first to concede that the car was a Ferrari in all but name. Enzo had no qualms about introducing Fiat into a project so dear to his heart. The two marques came up with a scheme whereby Ferrari were able to participate in an F2 racing series, from which they would have been otherwise debarred. For, their relative lack of resources meant they were not in a position to supply engines for the 500 Dino roadsters that the series' rules required to have been produced. For the mighty Fiat corporation, that was not a problem. 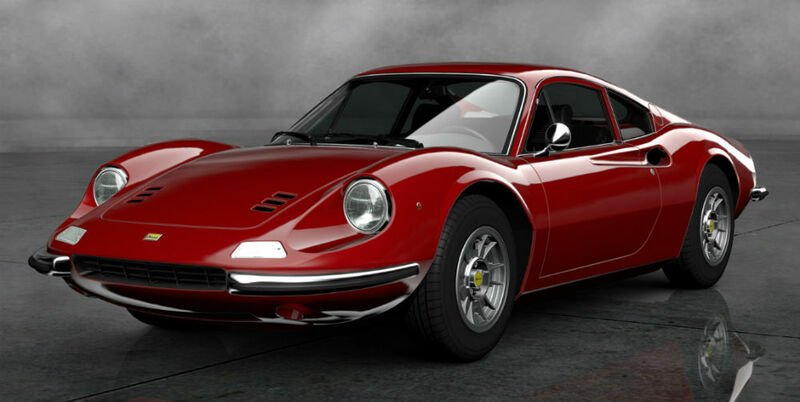 So it was that, inside every Ferrari Dino, there lurked the spirit of Fiat! In one regard, at least, the Dino was unaffected by all these mechanical shenanigans. Beauty on wheels, its Pininfarina and Bertone styling was visible in every perfect curve. It goes without saying that no car could ever make up for losing a son! However, it is to be hoped that the Ferrari Dino was at least a small source of solace for the great man.